For St. Patrick’s day I wanted to do something green, but a little out-of-the-ordinary. 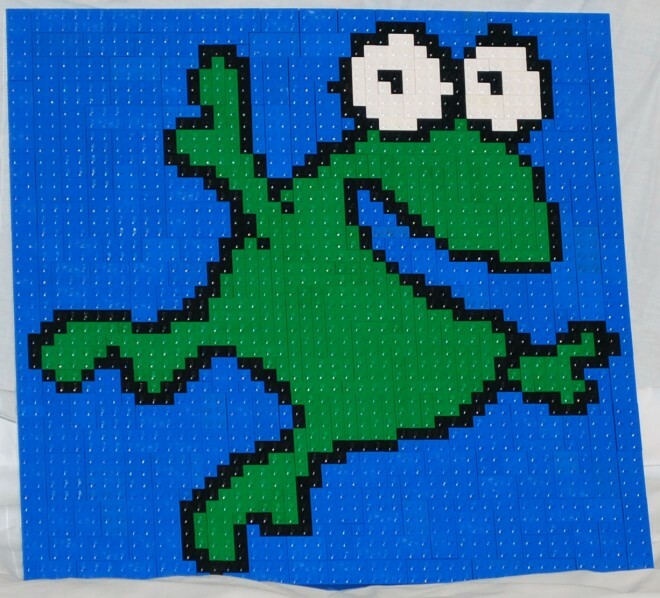 This mosaic is based on the cover of one of our favorite books for kids, Can You Hop? written by Lisa Lawston and illustrated by Ed Vere. I love Ed’s simple style and Lisa’s elegant little story. Unfortunately the book is out of print right now, but you might find a copy at your local library. When I checked there were also some acceptable used copies listed on Amazon. This one the boys actually helped a lot on. I mapped out the dimensions of the frog, and filled in his outlines. Then the boys filled in the rest of the colors with a little help from mom & dad.